Reflector GSO 8" f/4.0 + Cámara Canon 350D (13x150 seg. a 1600 ISO) Comet C/2014 Q2 Lovejoy on December 20, 2014, begins to come out from northern latitudes, although from latitude 40ºN from that I took this image the comet reached only an altitude of 15 deg. In spite of this, with approximately 5th magnitude was easily observable through small binoculars. 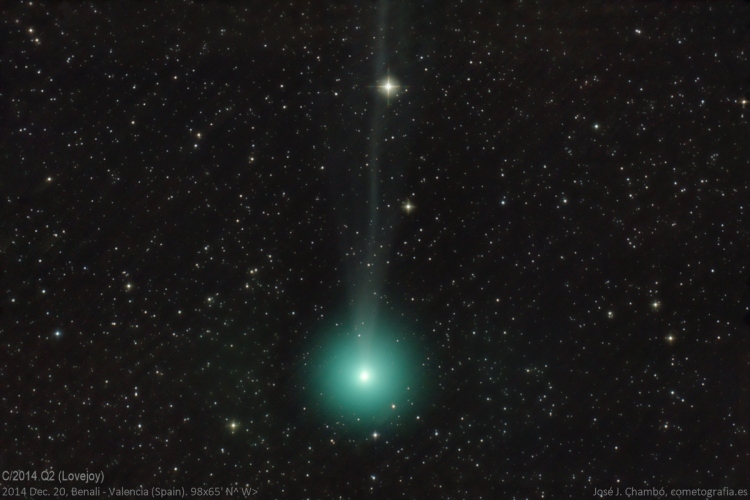 Its greenish coma has a 20' diameter while ionic tail shows some jets and gets out of field toward north.